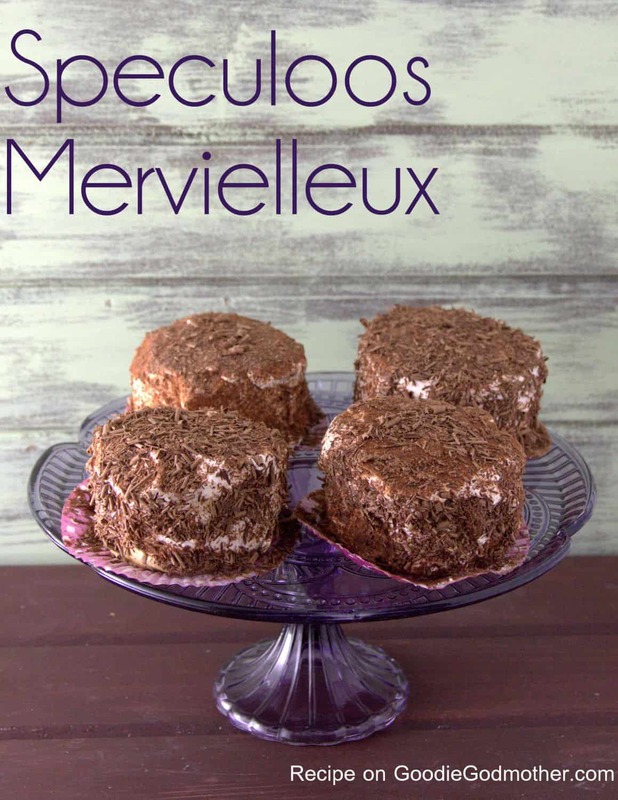 When this year began, I had no clue what a mervielleux even was nor that they are the new trendy dessert coming to the United States from France, where they’ve been made for years upon years. But I have followed David Lebovitz for years, an American chef/blogger living in France, and he posted an article about these, piquing my interest and inspiring me to make my own for Valentine’s Day dessert since I don’t live in New York, Los Angeles, or any trendy food city. Washington DC’s biggest claim to food fame right now seems to be brunch, and being from South Florida, “brunch” has been a thing as long as I can remember. 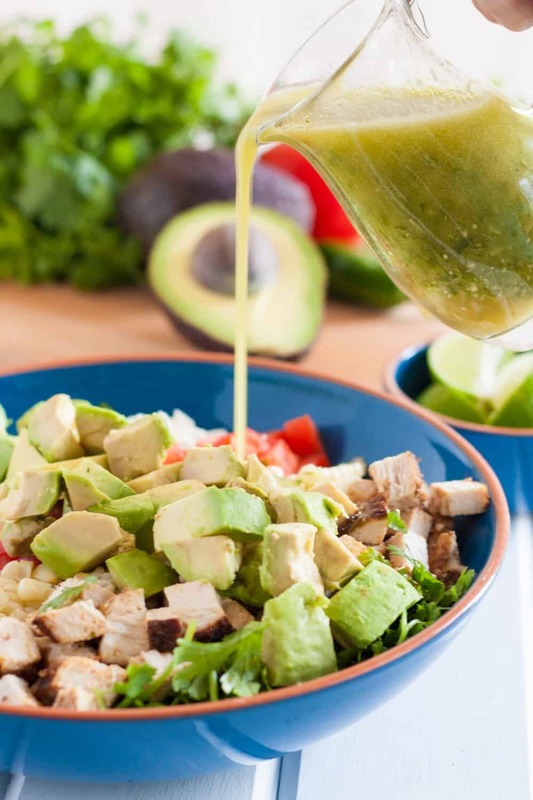 Not that there aren’t good restaurants in Northern Virginia and the broader DMV, it’s just that it seems to take a little time for trends to make it this way on a broad scale, especially out in Stepford suburbia where I live. 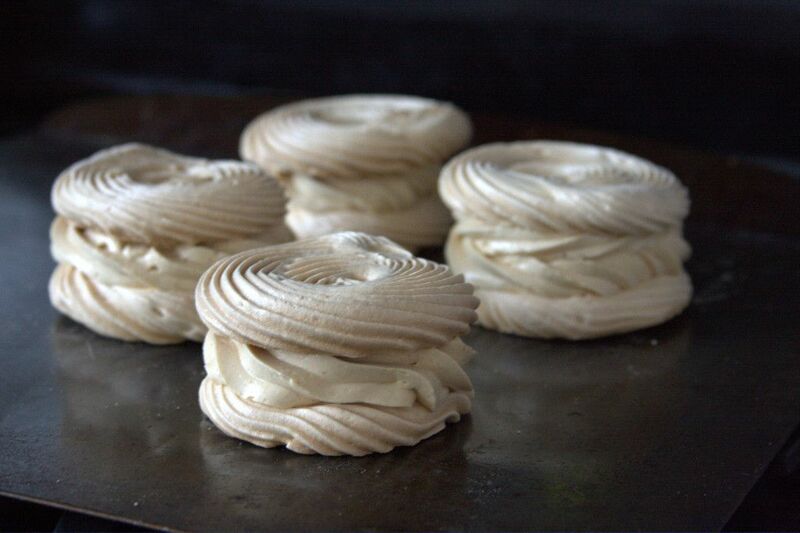 The biggest challenge for me with this recipe was making the meringues. I have tried for years (and by years I mean once every two or so for the past ten) to make successful meringues and my results have been hit and miss. Sometimes my meringues would dry, but usually I’d end up with sticky or flat meringues even though I followed the recipe exactly and I’m an amazing baker. But I’m also a stubborn baker and decided that I would try again so I could have this dessert, and I figured I’d have more luck given how I was able to figure out the quirks of this kitchen’s oven rather quickly for my macarons and the techniques are rather similar. Because I was worried about sticky meringues given the size of the discs, I may have slightly over-baked them, resulting in light golden meringues, but they still tasted just fine and worked beautifully in the recipe. I’ve removed what I think were an unnecessary 10 minutes from my baking time. This is the consistency you are looking for when your French buttercream is complete. 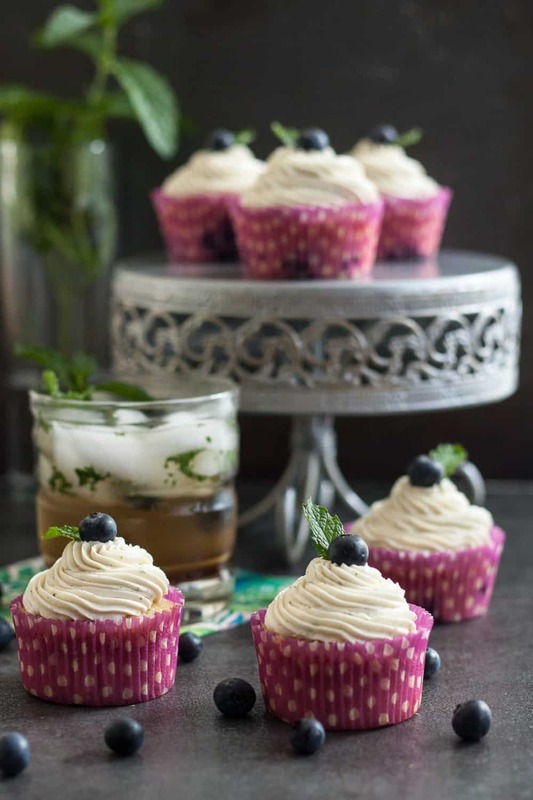 One thing that made me very very happy about this recipe is the French buttercream! It’s really creamy and makes a very rich filling, but it also uses exclusively egg yolks, so I don’t have extra yolks after using all the whites for the meringues. This kind of balance almost never happens for me and, had I decided to test French buttercream when I had the bakery and was churning out dozens of macarons and baked goods with Swiss meringue buttercream on a weekly basis, it would have regularly appeared on the repertoire. It might be too rich to cover a full cake, but I’m really liking it as a filling option, especially when using a rich flavor like cookie butter. I actually used leftover filling to fill macarons and they were delicious! You won’t have leftover filling though if you assemble all the merveilleux, but we ate some of the meringues alone because I wanted to confirm that I had indeed made a successful batch and hopefully broken my meringue curse. I’m cautiously claiming success. The mervielleux are best the day they are assembled, but you can make the meringues and even the buttercream in advance. Just bring the buttercream to room temperature and whip one more time before piping if you’ve had it in the refrigerator. I actually broke the process down into steps myself, making the meringues two days before, the French buttercream the day before, and assembling the day I planned to serve for dinner just after lunch. That way the completed mervielleux had a few hours to sit in the refrigerator so the flavors could blend and give me the perfect chewy/crunchy texture I read so much about. Dark chocolate and whipped cream cover rich French buttercream sandwiched between cinnamon meringues for a flavorful dessert! Preheat your oven to 230 F and line two baking sheets with parchment paper or a silicone baking mat. Pulse the white and brown sugar in the food processor 4-5 times to blend well. Place all ingredients except the sugar in the bowl of a stand mixer. You may also do this in a large mixing bowl with a hand mixer, you'll just be standing there for a little while. On medium speed mix the egg mixture until foamy like a bubble bath, then start adding your sugar 1 tsp at a time. You want to give each addition a few seconds to dissolve before adding the next. Once all the sugar has been incorporated, increase the mixing speed to high and mix for 7 minutes until you have really stiff foamy white peaks. Transfer the mixture to a piping bag or a large ziploc bag with the corner cut and pipe rounds in your desired size on the baking sheet. You can pipe them about 1" apart, they don't spread so keeping them close is okay. Bake for two hours until the meringues look "set" and then turn off the oven and leave the meringues in there another hour without opening the door. 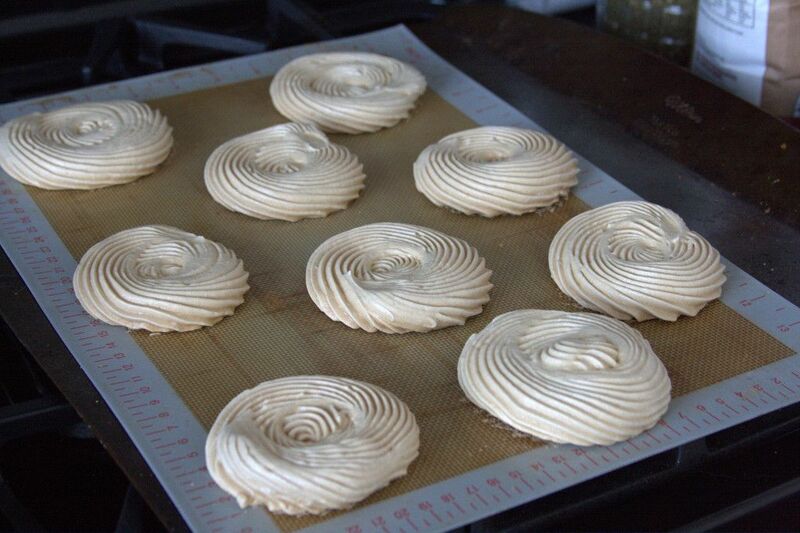 I did open the door briefly a few times during baking to check the meringues and they turned out just fine. The original recipe said to bake for an hour, my oven needed double that time, probably because my meringues were larger in size. After the hour rest, remove from the oven and allow to cool completely on the baking sheets. 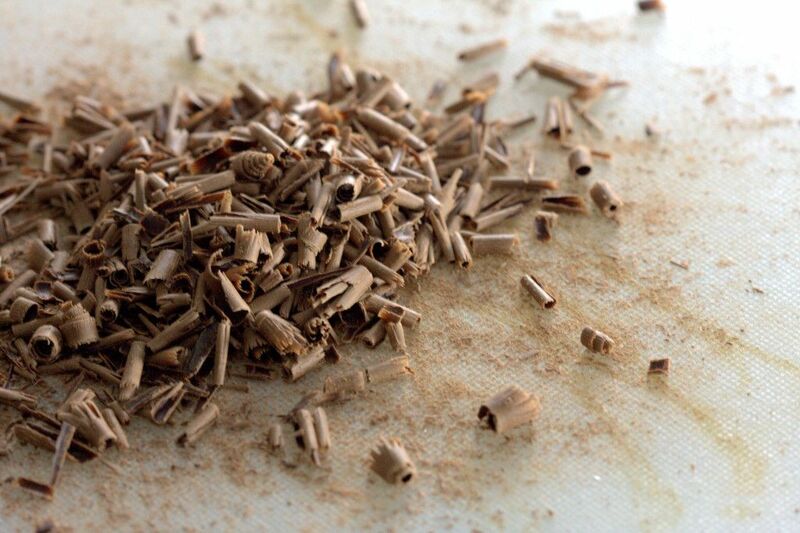 Transfer to an airtight container to store at room temperature until you are ready to assemble the mervielleux. You may store the meringues up to one week. 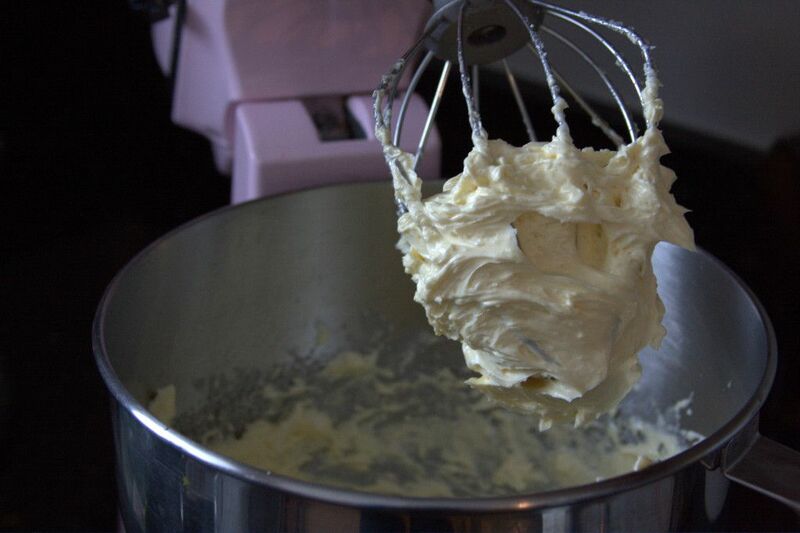 Place the egg yolks and salt in the bowl of your stand mixer, fitted with a whisk attachment. In a heavy-bottomed saucepan, combine the sugar and water and heat, swirling the pan only occasionally, to 238 F. When the mixture reaches 200 F, start whipping the egg yolks on high until they get fluffy and pale yellow. 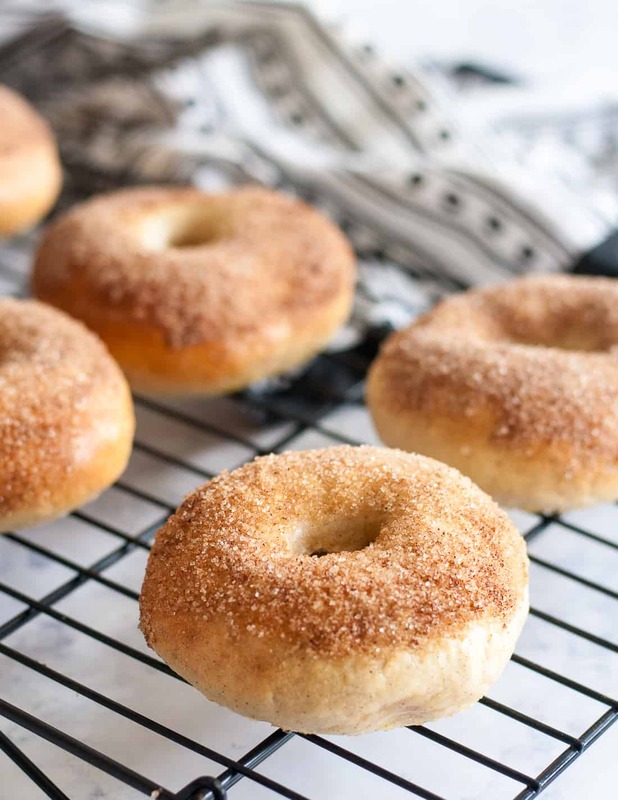 When the sugar mixture reaches temperature, remove immediately from the heat and slowly drizzle the sugar into the egg yolks, keeping the mixer running on high the whole time so you don't cook the yolks. Continue to whip the sugar and yolk mixture until the outside of the mixer bowl is no longer hot. Add the butter, in 1 tbsp increments and beat until the buttercream comes together. This can take up to 15 minutes. Add the speculoos and whip an additional minute to combine well. If you are assembling the mervielleux immediately, place the buttercream in a piping bag fitted with a jumbo tip or in a plastic storage bag with the corner snipped off. If you aren't using it immediately, transfer to a container and store covered in the refrigerator. When you are ready to assemble the mervielleux, make the whipped cream by beating 2 cups of well chilled heavy whipping cream with 3 tbsp sugar and 1½ tsp of vanilla until you reach the desired consistency. Be careful not to over-whip or you'll end up with butter. If you can't find pre-shaved dark chocolate (I didn't), you can easily make your own by scraping a peeler along the side of a chocolate bar as I did. 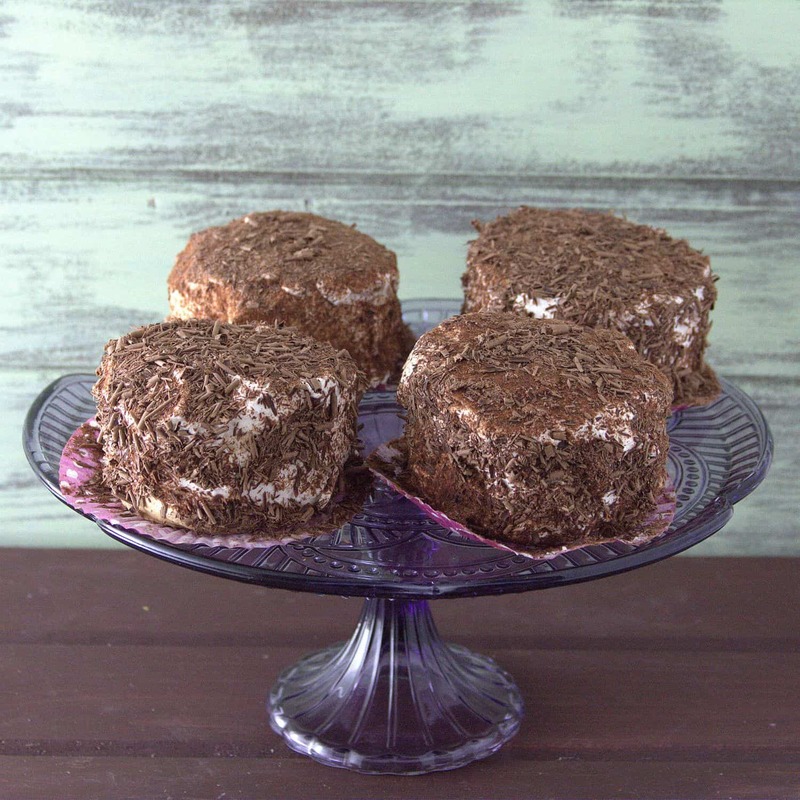 Or you may substitute with chocolate sprinkles or even crushed Biscoff cookies. 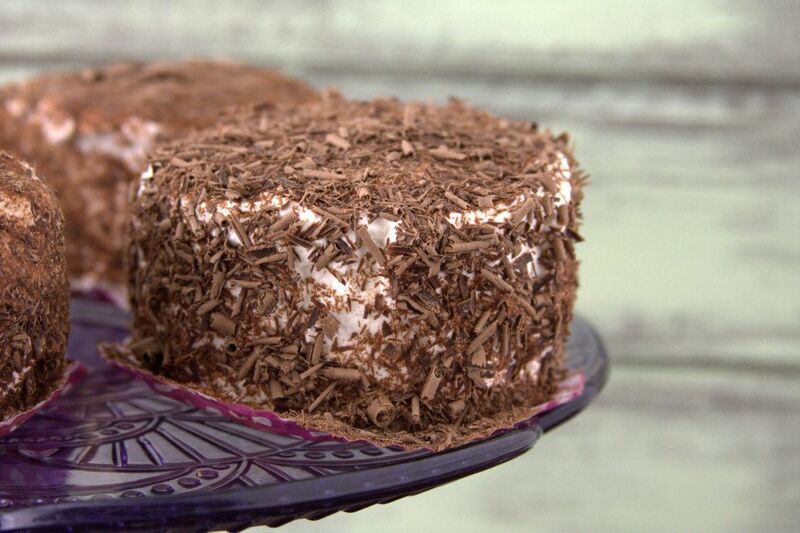 Take one meringue as your base and add a layer about ½-3/4" thick of French buttercream. Add the second meringue (see notes), and then cover the entire sandwich with whipped cream, cover immediately with chocolate shavings. Allow to chill in a covered container in the refrigerator a few hours before serving. Best if served the same day as assembled. - PLAN AHEAD! Because of the drying time for the meringues, it's best if you break down the steps over a day or two. - You can just use a single meringue for each, it seems that is more traditional, but I like more texture and I thought the sandwich style looked pretty. If you prefer a meringue base only, and I would use this for individual-sized desserts, you will need to double the filling and whipped topping recipes.